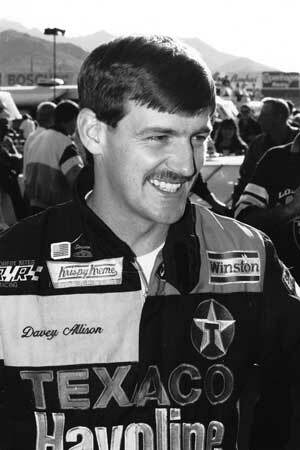 Come January, Davey Allison will hold a place in NASCAR’s Hall of Fame as a member of the Class of 2019. Consider that the late driver’s second home, as Allison has resided in fans’ hearts for three decades. Bursting onto the scene full time in 1987, Allison rocketed to Rookie of the Year with two wins and a career high five poles. The son of NASCAR Hall of Fame driver Bobby Allison, it didn’t take much success to achieve fan-favorite status, but Davey over-delivered. Allison continued to excel into his early 30s, winning 10.6 percent of his remaining races, his star power increasing by the lap. Allison had his career and life tragically cut short in 1993 at the age of 32, however, leaving the NASCAR family to mourn. To the fans, the loss was especially heartbreaking. The love he and his devotees had for each other was deep and mutual. With Allison set to be enshrined, fans who weren’t able to meet the down-to-earth kid from Hueytown, Alabama, before his passing will get a chance to soak in Allison’s legend. The 19-time winner would’ve loved to see people relive his career. And there wasn’t anything fans didn’t love about him.